On this day one hundred years ago, 75 men of The Black Watch lost their lives. Read on to discover what caused this spike in casualty numbers. As the situation for the besieged British forces at Kut grew more desperate, General Townshend eventually announced that he would have to put the defenders on half rations. This increased the sense of urgency amongst the Kut relief force. Having suffered heavy casualties at the battles of Shaikh Sa’ad on 7th January and the Wadi on 13th January, and with the Turkish defences in front of them stiffening, the possibility of being able to relieve Kut seemed more and more remote. This did not stop the soldiers of the 7th Division though and doggedly they kept going, one blistered footstep in front of another. There never seemed to be an end to the Turkish troops though, and these weary men, undersupplied and forever thirsty, performed almost superhuman feats of bravery and endurance, as they slammed themselves against Turkish defences time and time again, the thought of their fellow soldiers enduring the hell that was the siege of Kut driving them forward. By the 20th of January the British 7th Division was beginning to resemble a shadow of the army formation that had set out just two weeks earlier. Heavy casualties, combined with sickness and the pace of the march, meant that many of its battalions were below half strength. The 2nd Battalion Black Watch seems to have suffered particularly badly, especially in numbers of wounded and killed, and could only muster some 250 effective soldiers for the battle to come. The Turkish army in front of them protecting the route to Kut, on the other hand, was well supplied and in a strong position. With the Suwaikiya Marsh on their left and the River Tigris on their right, it would have been difficult, if not impossible, to outflank their lines. As a result, the British forces would be required to storm the Turkish defences head on. 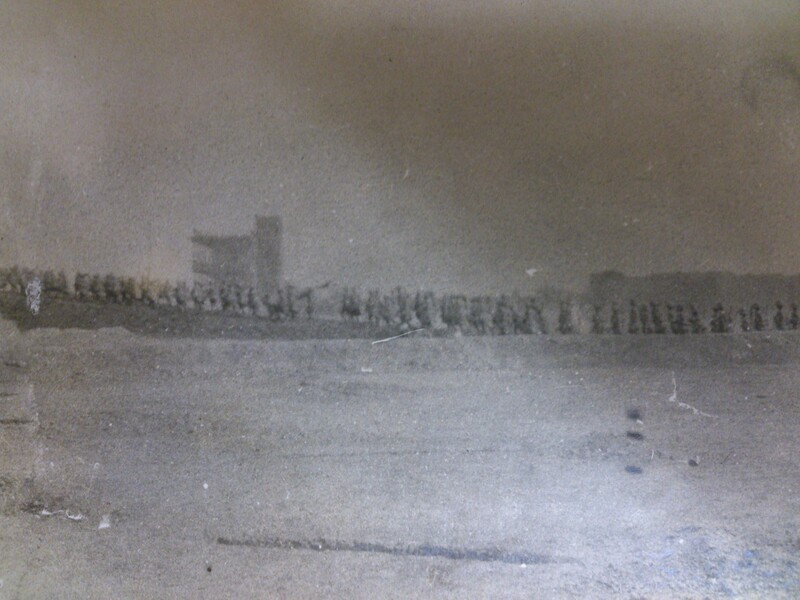 Black Watch soldiers marching in Mesopotamia. Traditionally this style of attack had not been a problem, and for the previous year the British had gotten used to the Turks running away at the sight of advancing British and Indian troops. By now though the situation was very different. No longer were the soldiers of the 7th Division facing raw and frightened troops, now they were facing veterans of the Gallipoli Front, soldiers who had taken on the British and beaten them. These men were not frightened of the skirl of the pipes or the war cries of the Gurkhas, but rather soldiers who knew their business and were good at it. Having occupied a series of trenches in front of the Turkish lines on 19th January, the next day saw the attacking battalions, including the 2nd Black Watch, only some 200 yards from the Turkish trenches. Major Hamilton-Johnston (who two weeks before was a Captain, but owing to casualties amongst the officers of the 2nd Black Watch found himself not only an acting Major, but also commanding the battalion) wrote to the Brigade Commander stating that he was confident his men could take the first Turkish line, but due to the lack of men would need support to hold it. He therefore asked for the supporting battalions to be brought closer to the 2nd Black Watch; unfortunately this suggestion was not carried out. The British artillery opened up a barrage on the 20th which continued throughout the day and the following morning. Just how ineffective this barrage was, using weapons some of which dated back to 1873, is proved a few days after the attack when, during a temporary truce to clear the battlefield, a Turkish officer mentioned with contempt the power of the British artillery. At seven minutes past eight on the morning of the 21st the 2nd Black Watch surged forward from their trenches towards the Turkish lines, just as the artillery barrage lifted. With their usual mixture of bravery and stubbornness the 2nd Battalion did manage to take the Turkish trenches to their front, despite enduring a hail of bullets as they advanced. However the attacking troops to their right and left, the Dogras and the Buffs respectively, failed to achieve the same level of success and as a result The Black Watch found themselves isolated and exposed in their captured trench. The Turks, who had initially fled to their second line trenches in the face of The Black Watch assault, soon realised just how few troops were facing them and two counter attacks, one to the left and one to the right of the 2nd Black Watch, began to develop. These were kept at bay for a while by a small number of machine guns that had been captured from the enemy. However sheer weight of numbers soon began to tell, and gradually the defending soldiers of The Black Watch found themselves being squeezed tighter and tighter into a small part of the captured trench. It was at this point that Major Hamilton-Johnston was killed. In fact so many officers had fallen, wounded or killed, that command of the Battalion devolved down to Second Lieutenant Henderson, who had just three month’s service with the Battalion. For two hours the Battalion held out against almost overwhelming odds. Another who fell during this time was Sergeant Finlay, who had won a Victoria Cross on the 9th May 1915. By 10.15 am though the situation was desperate, almost surrounded and risking being destroyed, Henderson gave the command to withdraw, bringing with them one Turkish officer and around a dozen captured soldiers. The withdrawal was by no means easy and the remnants of the Battalion fought their way back to an advanced British trench some 50 yards in front of the British lines, which they then held until nightfall when they were relieved by soldiers from the 9th brigade. Back behind the lines the exhausted Henderson handed over command of the Battalion to Second Lieutenant Stewart-Smith, the Transport Officer, who ordered the 99 surviving men of The Black Watch to rest. The next day, after the Battalion having been reinforced by the Battalion Headquarters officers and men, reported a strength of 5 officers, which included the Medical Officer and the Chaplain and 164 other ranks. This was out of a total strength of 29 officers and 900 men who had landed at Basra just three weeks before. This entry was posted in First World War, On This Day and tagged 2nd Battalion, Black Watch, First World War, Mesopotamia, military, museum, The Black Watch Castle and Museum, The Black Watch Museum, World War One, WWI. Bookmark the permalink.